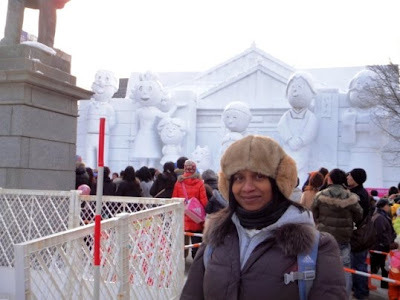 As I wrote in the previous post, on 11th and 12th February hubby and I had been to Sapporo to see the annual snow festival. 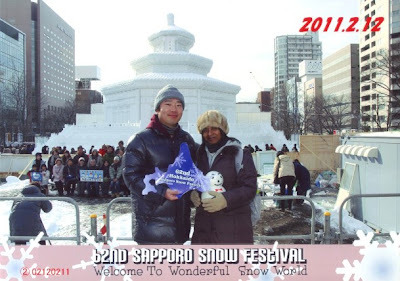 Sapporo snow festival is one of Japan's largest winter events which attracts about two million people from Japan and abroad every year. 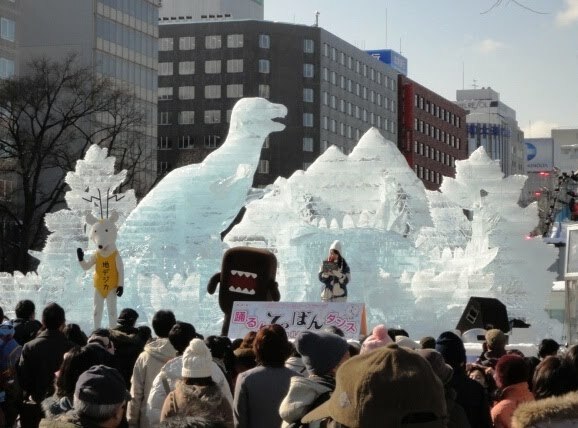 The festival is held for seven days in February and visitors can see hundreds of beautiful snow statues and ice sculptures at the three main festival sites, namely, Odori Park, Tsudome, and Susukino. On 11th February we enjoyed seeing the Odori Park snow festival at nighttime. The large snow and ice sculptures dazzled with colored illumination and we really enjoyed the festival. 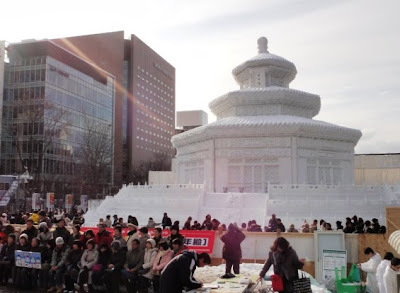 On 12th February, we again visited Sapporo snow festival site at Odori Park to enjoy the sculptures and the festival mood at daytime. We left the hotel at Chitose by 9.30 am and reached Odori Park site by 11.15 am. First we visited Sapporo Clock Tower which is one of the major sightseeing spots in Sapporo. I will write about it in the next post. 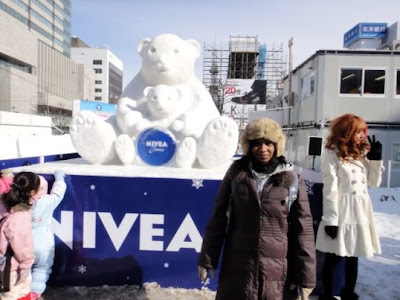 In this post I will write about the snow and ice statues sculpted at Odori Park festival site. 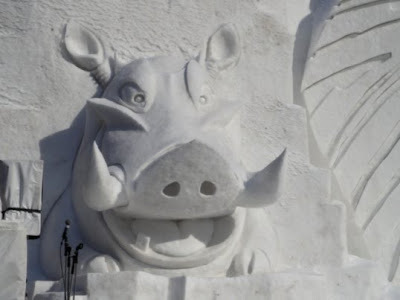 I have already written about most of these sculptures in details in the previous post. 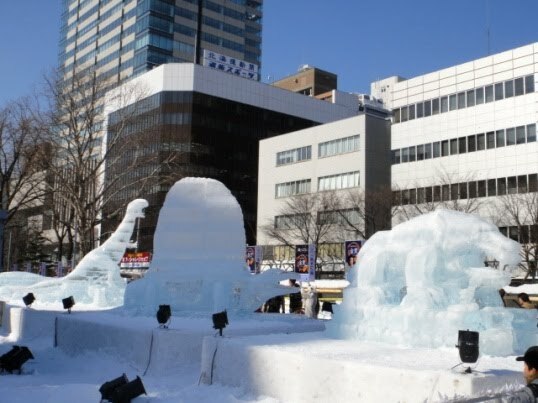 Please click here for the details of most of the large and medium sized snow and ice statues sculpted at 2 to 10 Chome of Odori Park. Just in front of the entrance of the snow festival site, there was Sapporo Television Tower which looked wonderful but so different than the nighttime illumination. 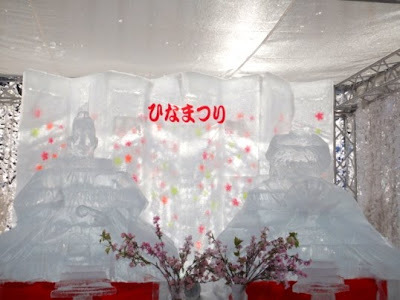 Near the entrance there was an ice sculpture of the Emperor and the Empress hina dolls as hinamatsuri festival was just around the corner. 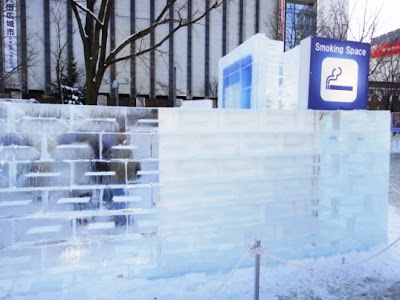 As we walked further, we saw a smoking area that was completely made out of ice. The ice walls looked so nice. Doshin Ice Square at 2-Chome had many medium sized ice sculptures of dinosaurs. 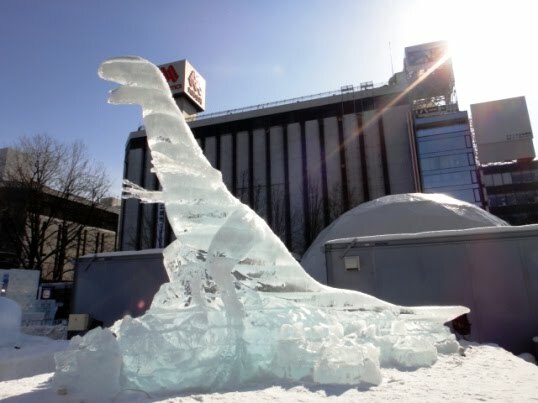 There was also a large ice sculpture named Ice Museum - World of Dinosaurs. 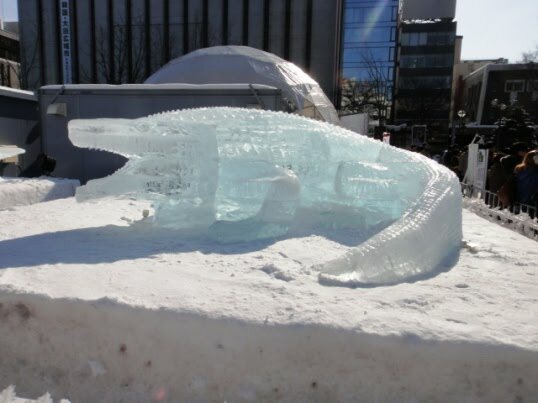 It was nice to see various ice sculptures of extinct dinosaurs in daylight. 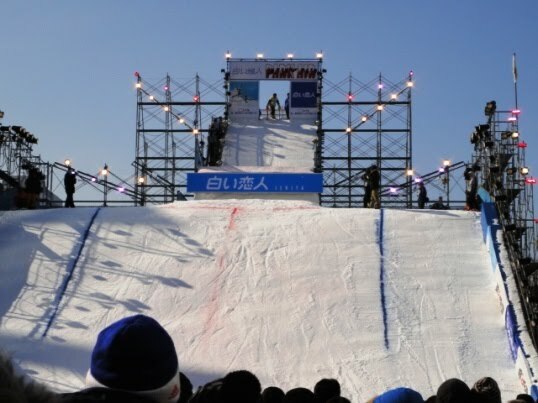 HTB Park Air Square at 3-Chome had a snowboard jumping platform with a giant 60-meter jump ramp at a height of 24 meters and a maximum slope angle of 39 degrees. 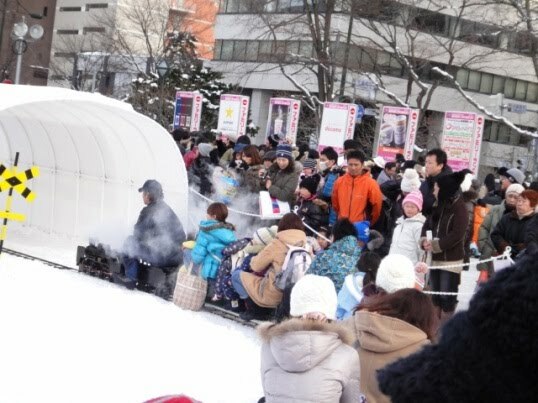 We enjoyed watching part of a splendid snowboard jumping competition performed by professionals. I have compiled a video of the show. 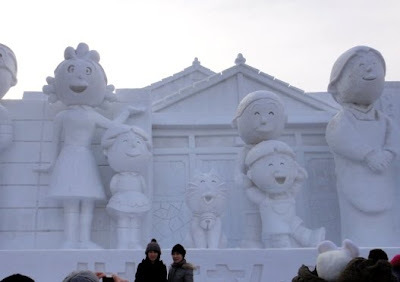 Around this area there were several medium sized snow sculptures also. STV Yomiuri Square at 4-Chome had a large snow sculpture named Hokkaido - a Tourist Wonderland. 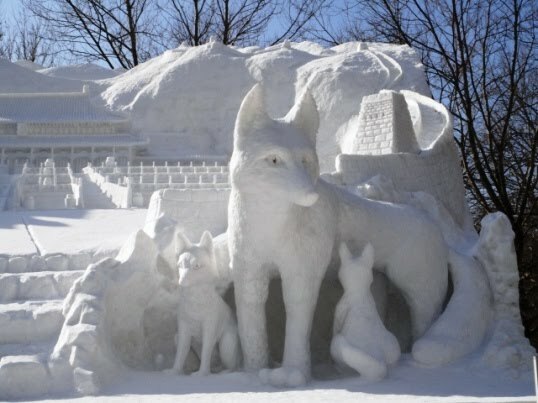 The display of sculptures of Blakiston’s fish owl as well as Ezo red fox and her young kits looked pure white in daylight. Sculptures of the former Hokkaido Government Office Building and the Forbidden City of China looked elegant and grand. 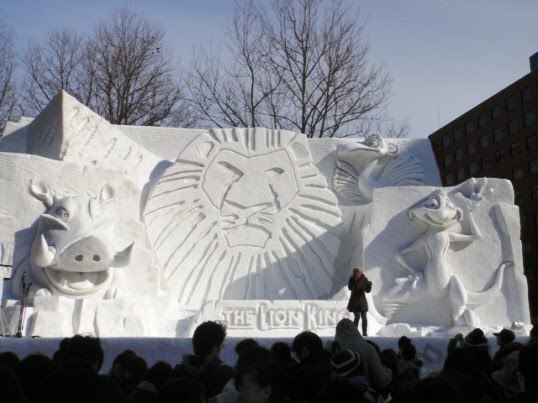 Environment Square at 5-Chome had a large snow sculpture named The Lion King. 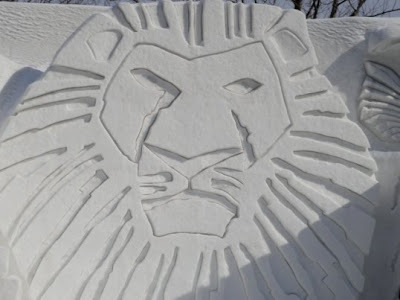 Snow sculptures of the characters from this famous musical such as Timon - the meerkat, Pumbaa - the warthog, Zazu - the hornbill, and the symbol of the Lion King looked marvelous. At 5-Chome, we saw a medium sized snow statue of Yuki Saito, a popular rookie of the local professional baseball team Nippon Ham Fighters. The statue seemed to have a slightly different facial expression in the daylight. Probably it is just my imagination. 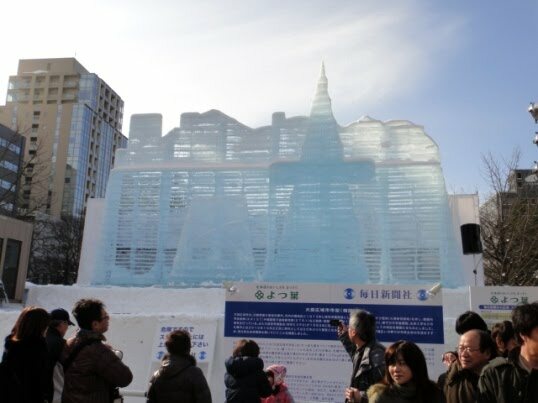 Mainichi Newspapers Ice Square at 5-Chome had a large ice sculpture named Daejeon Metropolitan City. 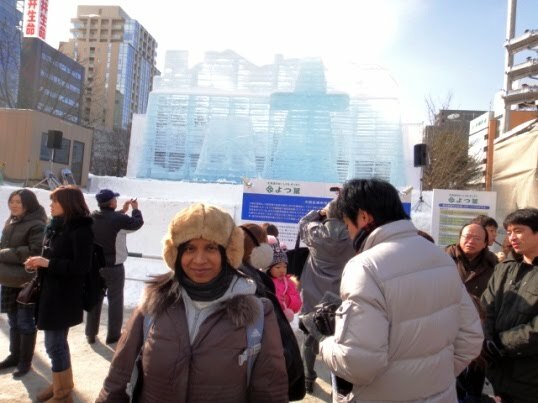 The sculpted statue of the fifth largest region within Republic of Korea looked so exquisite in daylight. The sunlight gave a bluish tinge to the sculpture, which seemed to have a mystic aura. At 6-Chome, we saw a medium sized snow sculpture named School Education Characters of Sapporo. 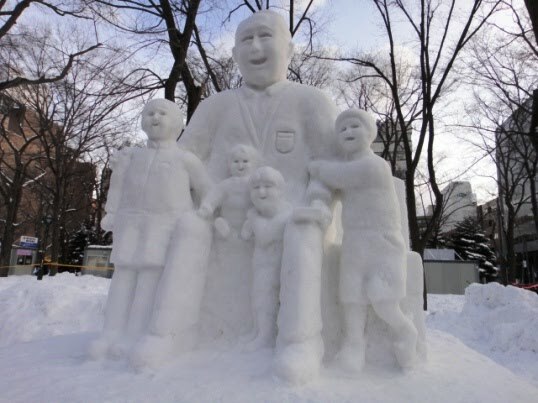 The three characters of this sculpture are Chikkyun (environment), Yupporo (snow), and Ohhon (literature) which have been introduced as unique themes for school education in Sapporo. 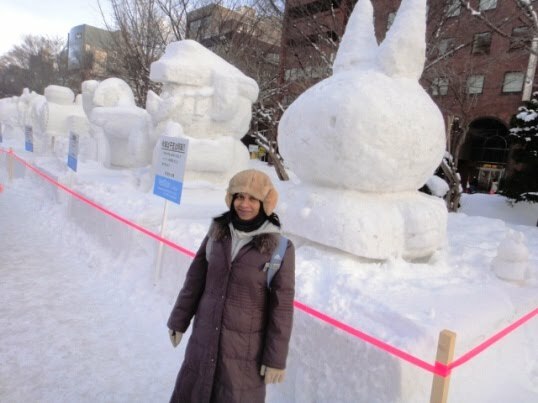 There were a few more cute medium sized snow sculptures at this area. 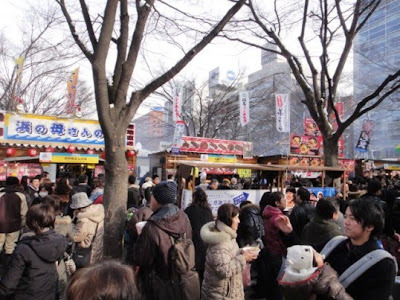 Hokkaido Food Fair was also held at 6-Chome. 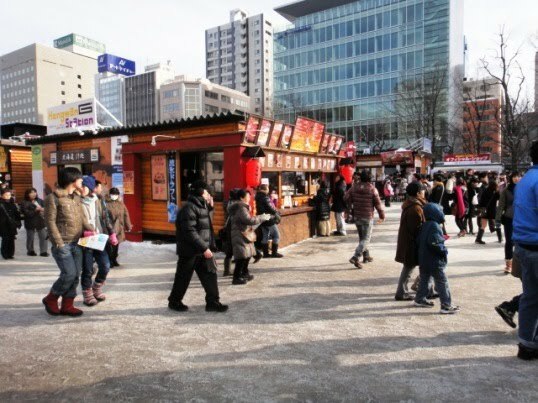 Many food stalls sold various kinds of local delicacies. At the end of 6-Chome and the beginning of 7-Chome, there were several medium and small sized snow statues of various animation characters. HBC Beijing Square at 7-Chome had a large snow sculpture named The Temple of Heaven - The Hall of Prayers for Good Harvests. 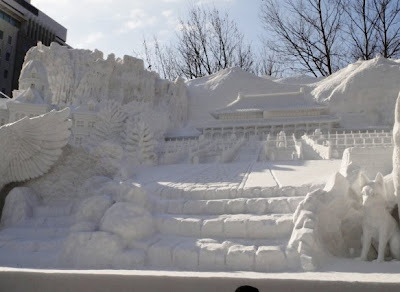 The snow structure looked superb and pure white in daylight. 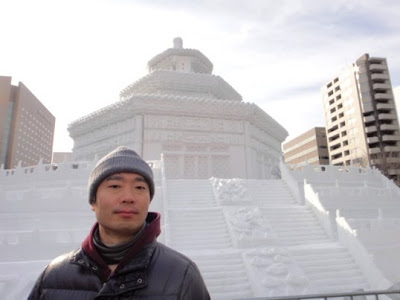 Hubby and I took a professional photo of us in front of the structure for keepsake, which was taken from afar. 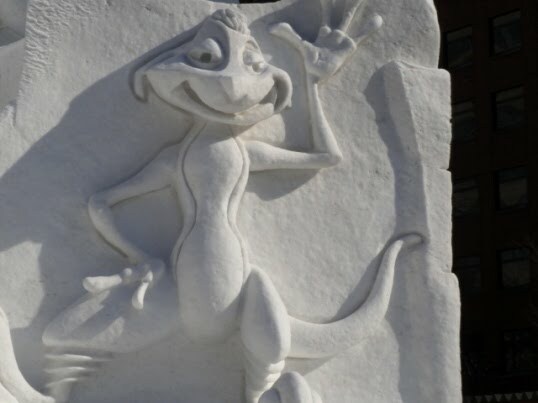 Afterwards we walked up to the sculpture and took a few photos from very near which showed the details and intricate designs on the building wall. As we walked further, we saw several food stalls that sold various kinds of Hokkaido delicacies. 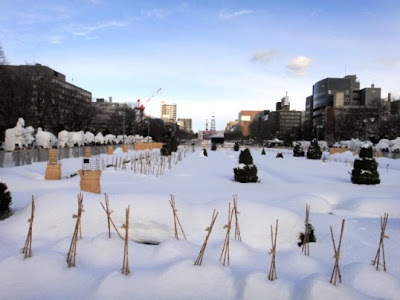 HTB Snow Square at 8-Chome had a large snow sculpture named National Treasure - Hiunkaku of Hongwanji. 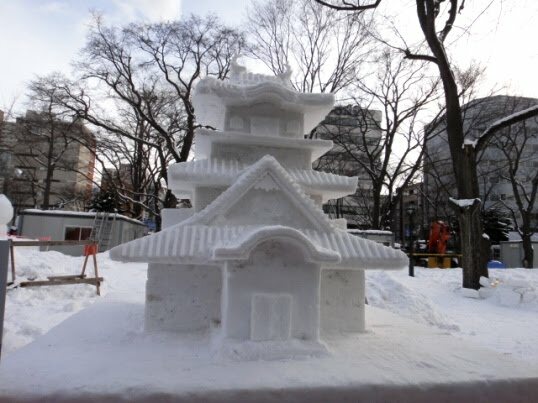 The snow structure of the National Treasure had a mysterious beauty and shone brightly in daylight. Citizens’ Square at 9-Chome had many medium sized snow sculptures like Snowman Festival, a statue of mother comforting her crying child, a statue with many snow hearts around, a medieval castle, elephants, and several more cute statues. As we walked further, we saw children as well as adults enjoying riding a mini-train that ran on the snow. 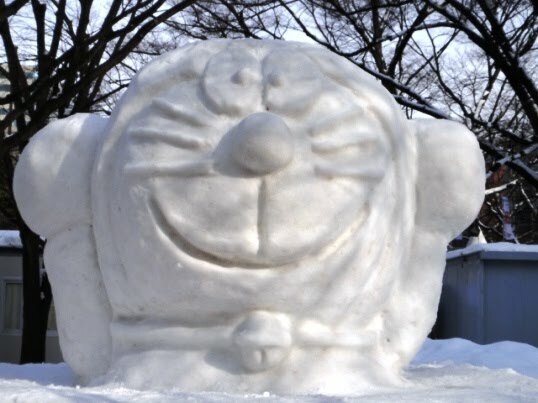 UHB Family Land at 10-Chome had a large snow sculpture named Sazae-san which is a very popular animation aired on Fuji Television Network. 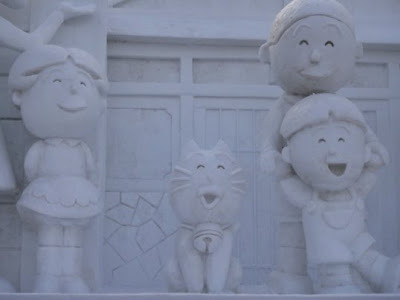 The huge sculptures of Sazae-san and her family members looked pure white and so expressive. 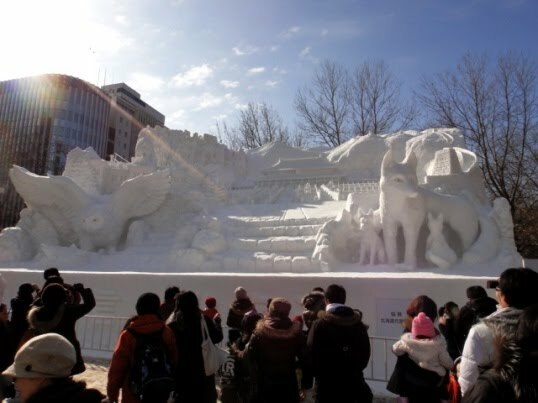 International Square at 11-Chome was the site for the 38th International Snow Sculpture Contest. 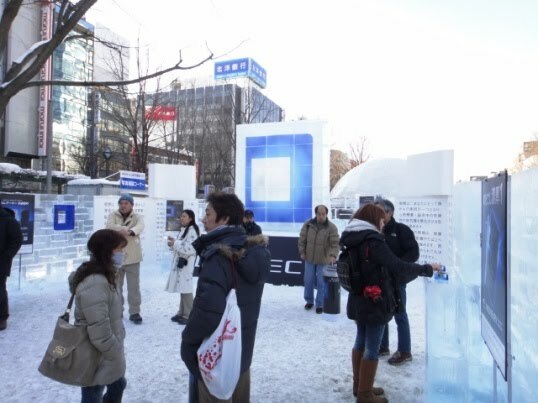 We had missed seeing this square the previous night as it was not illuminated. 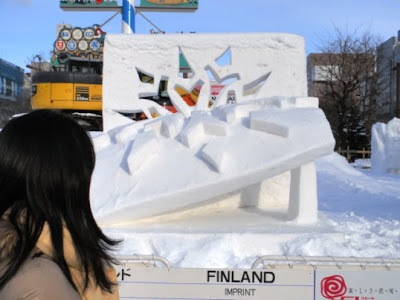 Sixteen teams from all over the world competed in the contest. 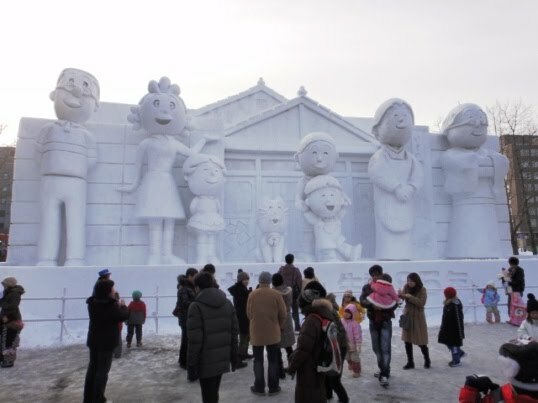 The site was filled with a variety of snow sculptures and statues. The contestants from Lithuania sculpted a statue named ‘The world is our hive, be responsible’. 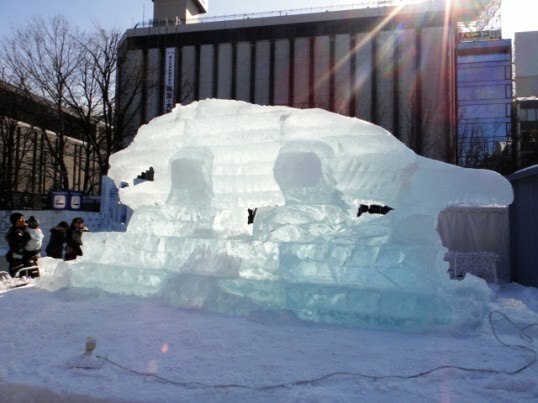 Bees are considered to be the symbol of hope, energy, social organization, diligence, and intelligence. 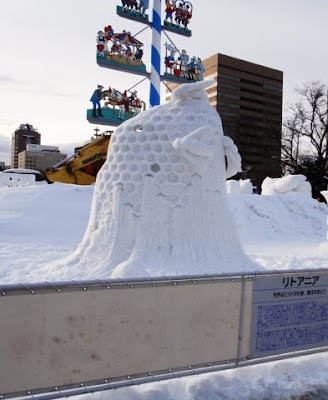 Hexagonal honeycomb of bee is the symbol of the heart and represents the sweetness of life. 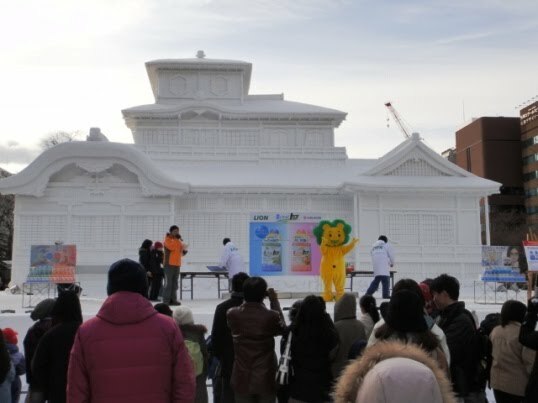 Honey is made without destroying any form of life. 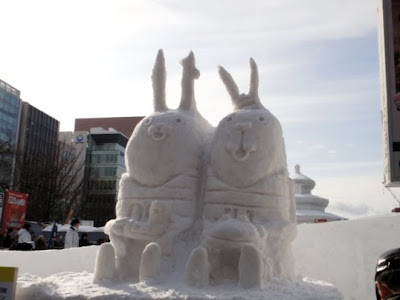 The sculpture denoted that in any community as in a beehive only aware social members can create a better environment and future. 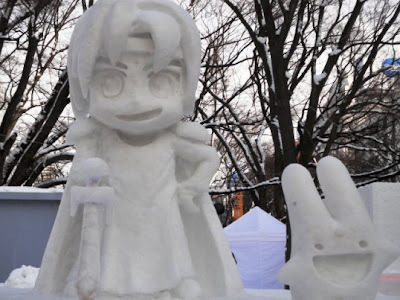 This statue was the winner of the contest. 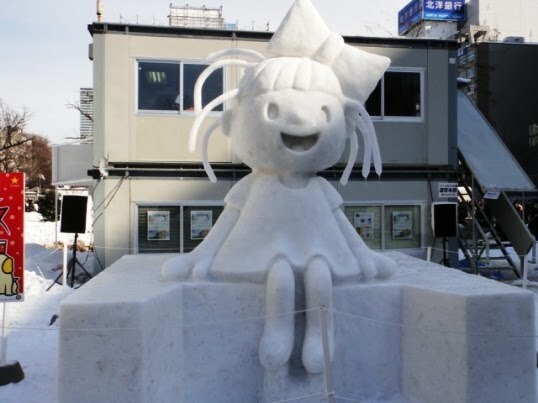 The contestants from People’s Republic of China made a statue named ‘Girl’s Smile’. 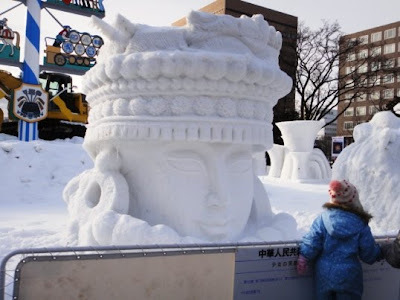 It was a statue of a smiling girl of a Chinese minority Miao wearing an ethnic headdress. 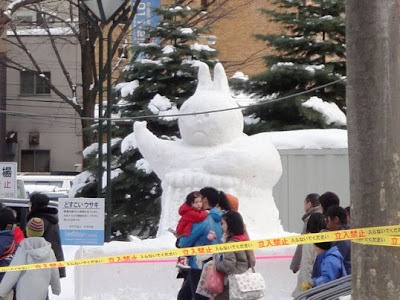 The statue won third prize. 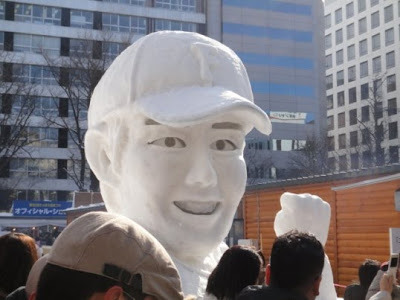 The contestants from Korea sculpted a statue named ‘Silla-Seokguram’. 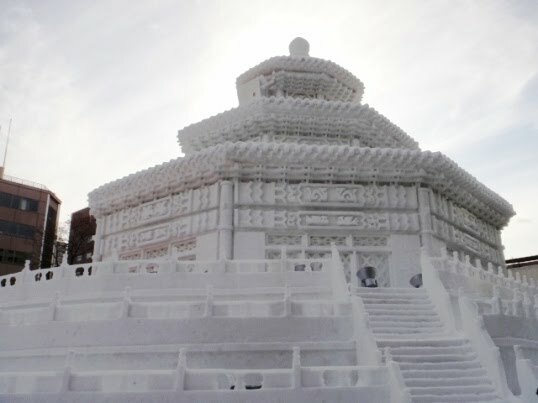 It is a masterpiece in Silla in Korea History that unites construction, geometry, mathematical principle, religion, and arts. 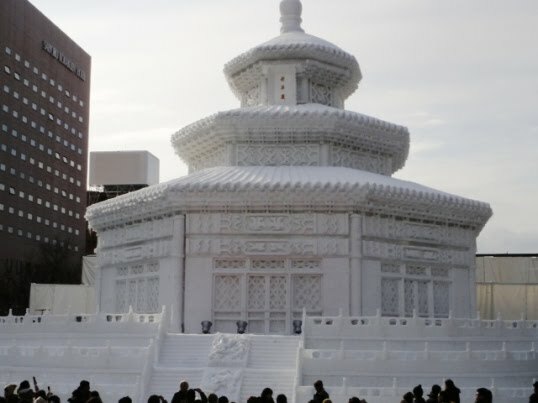 It was registered as a World Cultural Heritage in 1995. 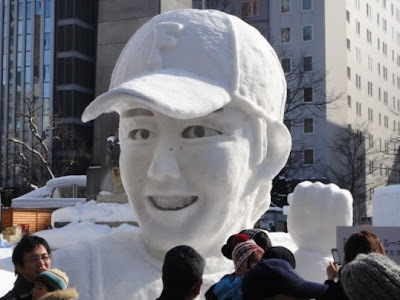 The snow statue was sculpted beautifully. 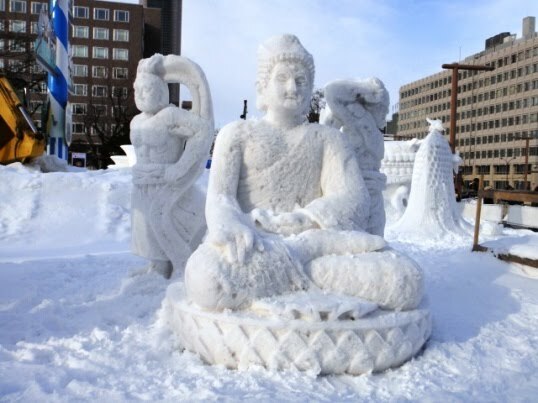 The contestants from Indonesia sculpted a statue named ‘Bimasena’, a protagonist in the epic Mahabharata. He was a disciple of Resi Durna and was given the task to look for water as a source of life at the bottom of the vast south sea. Bimasena encountered many challenges during his journey through the deep ocean. 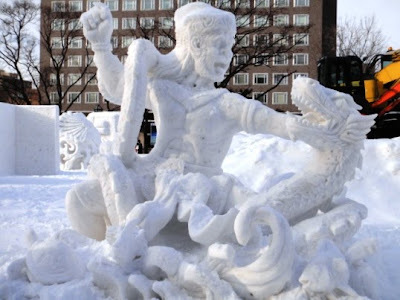 One of them was the attack by the dragon Nemburnawa. He eliminated the dragon by slashing the enemy’s stomach with his finger nail. 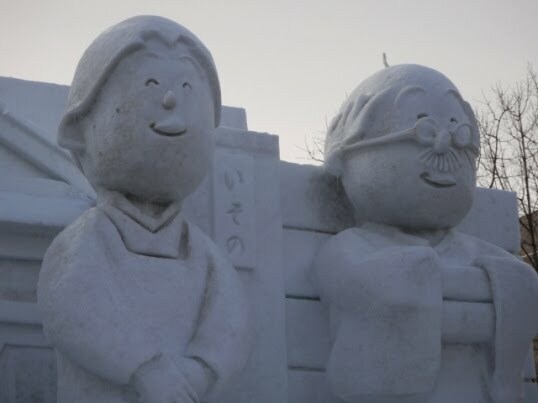 This scene was sculpted at the festival site and the statue won fifth prize. 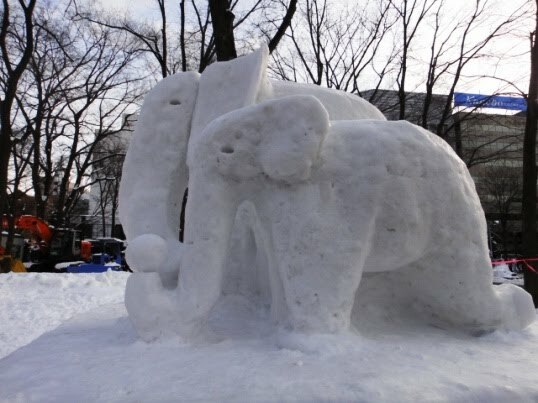 The contestants from Thailand sculpted a statue named ‘Paradise Island’. The concept was inspired from one episode of Phra Abhai Mani, a classical Thai literature composed by the poet Sunthorn Phu in 1821-1823. 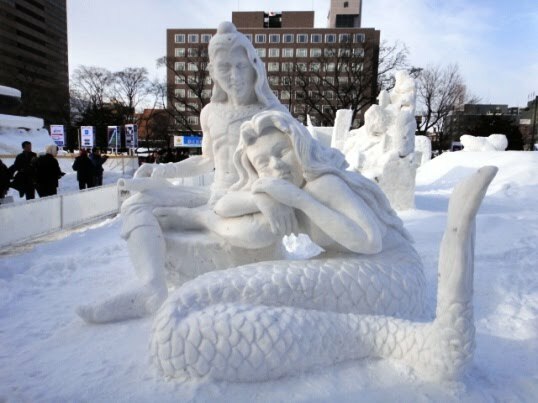 The story is about Phra Abhai Mani, who escaped giantess Pisua Samudr and fled to ‘Koh Kaew Pissadam Island’ with a mermaid. The snow sculpture signified that people in present day life are in a rush but they need to relax by going to beaches and islands. The contestants from Finland sculpted a statue named ‘Imprint’. The theme suggested that we leave imprints which can be real like our steps on a ground or snow. They can also be invisible like memories in our heart and mind. Some imprints can have an impact through generations and some melt away. This statue was the runner-up of the contest. The contestants from Malaysia sculpted a statue named ‘Wau Bulan’. 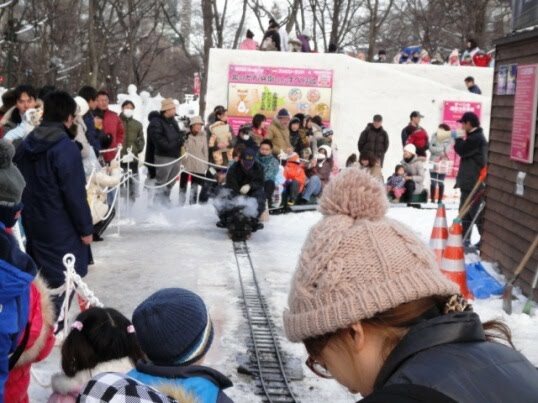 Wau Bulan or moon kite is a popular traditional game in east Malaysia and flown throughout the year especially after the full moon harvest. 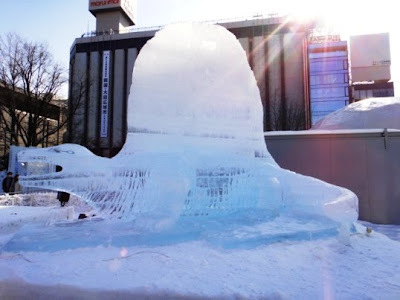 It is named from the crescent moon-like shape of its lower section, resembling a rising crescent moon when flown. The sculpted kite looked so real. 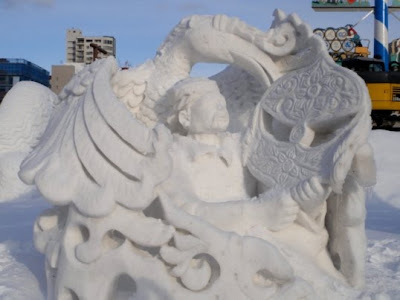 The sculpted hornbill, the state bird of Sarawak in Borneo symbolizes purity, courage and strength of the Iban people in east Malaysia. 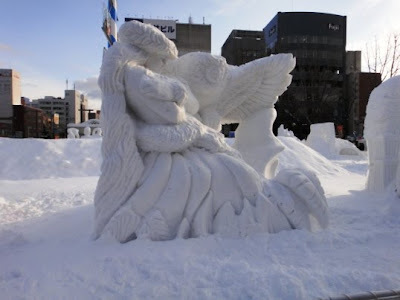 The contestants from Hawaii sculpted a statue named ‘The legend of the sacred owl’. The legend relates the story of an Oafu man who robbed an owl's nest. 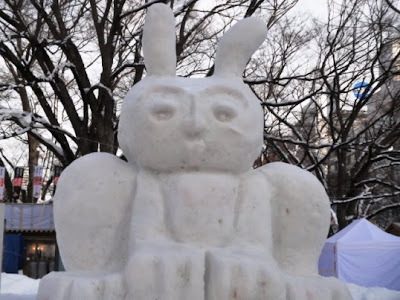 The owl-parent shrieked with grief, so the man felt sorry and returned the eggs unharmed to the nest. He also took the owl as his god and built a temple in its honor. 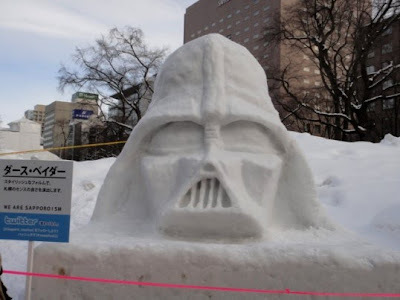 The ruling king thought it to be an act of rebellion and ordered the man's execution. 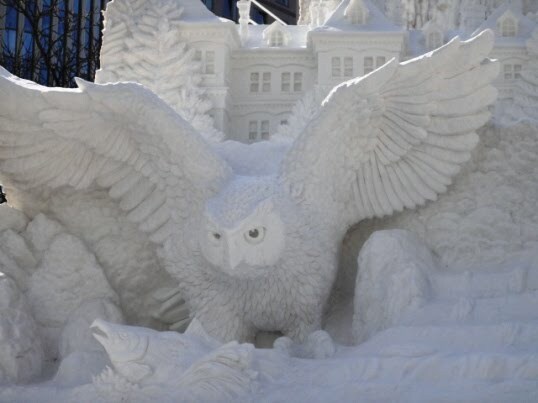 When the soldiers poised their weapons, the owls gathered and darkened the skies with their wings so that the man could not be killed. 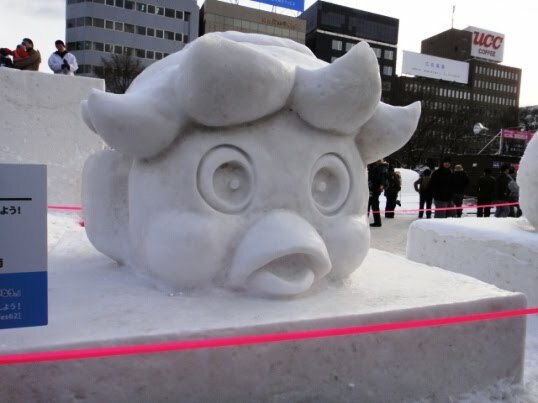 The sculpted snow statue was so graceful. The contestants from Hong Kong sculpted a statue named ‘Lion Dance’. Lion Dance dates back over a thousand years and the ritual combines the elements of Chinese Kung Fu and art. Lion is considered to be an auspicious character for guarding gates and for exorcising evil spirits. 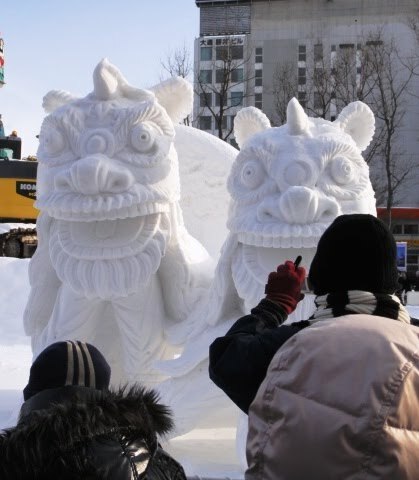 Two men wear a costume of lion head and tail, and mimic a lion’s movement along with the rhythm of drums and gongs during festivals. 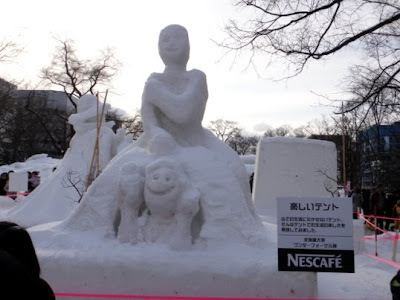 This statue won fourth prize. 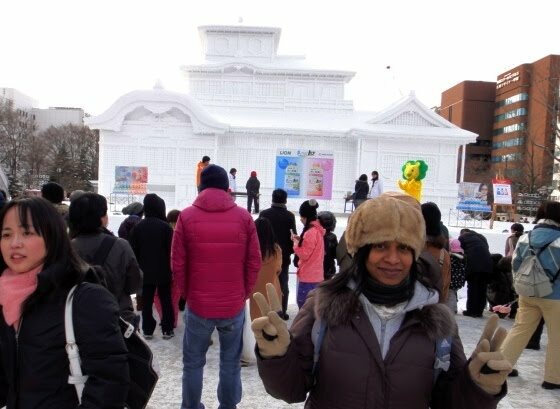 Citizens’ Square at 12-Chome had many unique small snow sculptures crafted by the people of Sapporo. 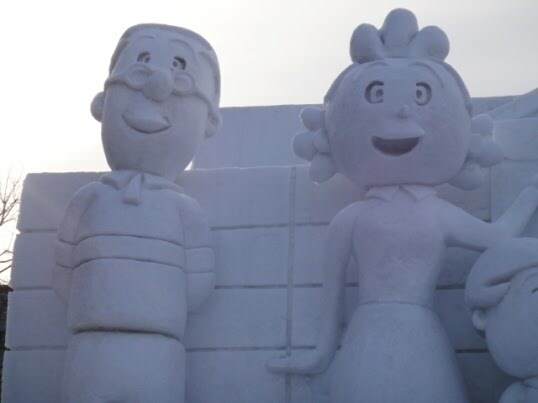 We enjoyed watching those sculptures. It was really nice to see Sapporo snow festival during daytime as well as nighttime. Both were unique experiences. 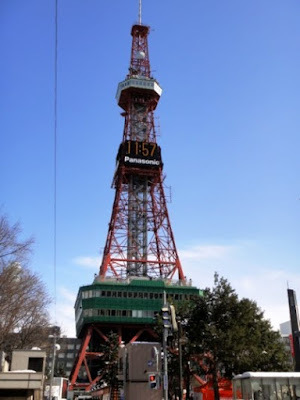 In the next post I will write about Sapporo Clock Tower and various foods we had at Sapporo. 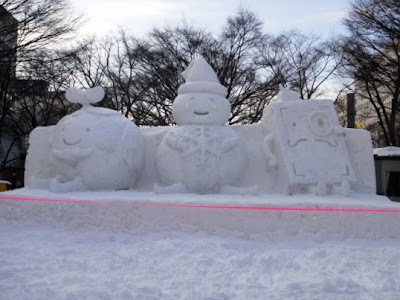 Manisha, I'm just lost in this beautiful post of yours.. Just unbelievably amazing snow art !!! 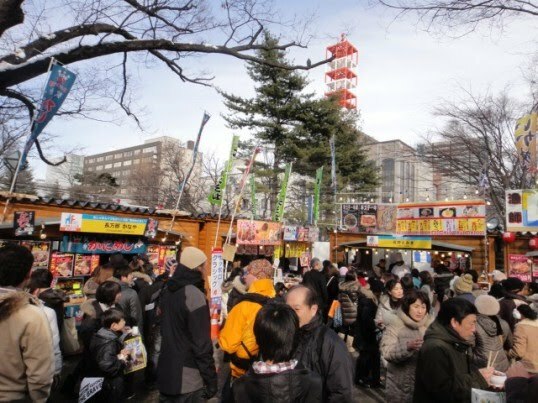 You are so lucky to have so many varied festivals in Japan. 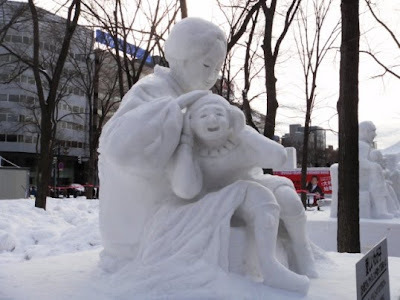 I lost my breath so many times while seeing themasterpieces one by one by scrolling down your page. These artists or mistries must be having God's fingers in their hands. For how long these sculpters survive in open ?. 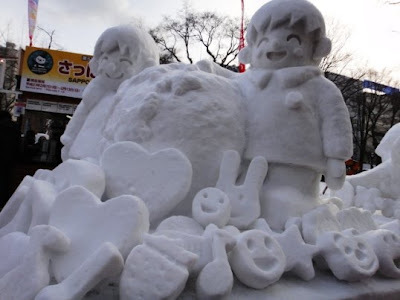 Really really enjoyed this post... 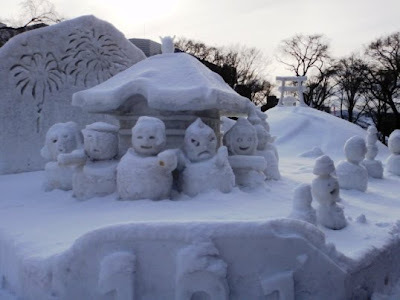 Wonderful and thanks for sharing !! 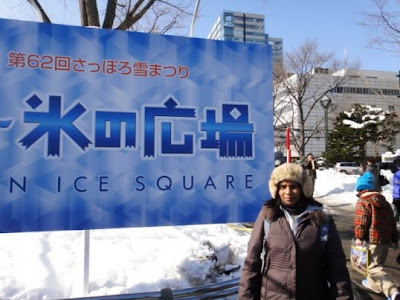 Thanks Dr. Yadav for your nice comment. 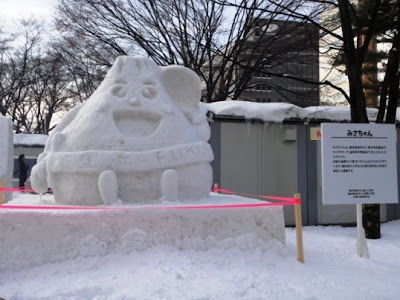 Yeah, there are many festivals in Japan. I also loved the snow and ice sculptures at the festival site. 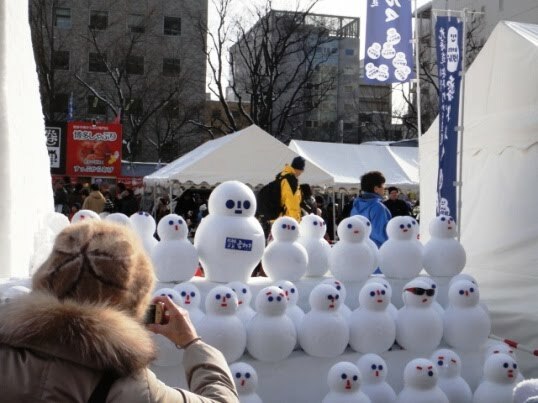 All these statues looked marvelous.